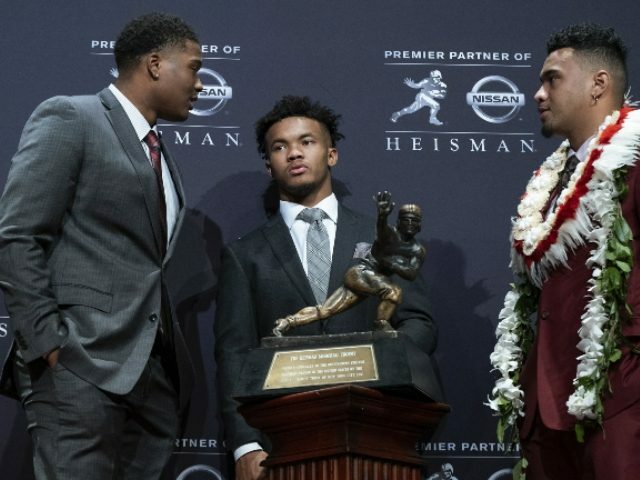 NEW YORK (AP) — Kyler Murray replaced a Heisman Trophy winner by becoming a Heisman Trophy winner. The Oklahoma quarterback won college football’s most prestigious individual award Saturday night, edging Alabama’s Tua Tagovailoa and setting up a College Football Playoff matchup of Heisman winner versus runner-up. This season, Murray stepped into the starting job at Oklahoma held by last year’s Heisman winner and first overall NFL draft pick, Baker Mayfield. Oklahoma is the first school with have Heisman-winning quarterbacks in consecutive seasons and the fifth overall with winners in back-to-back years. Oklahoma’s late-season Heisman campaign for Murray harkened back Bo Jackson, the 1985 Heisman winner who went on to star in both the NFL and MLB, and his Bo Knows Nike ads. “The NFL hasn’t had a 5-10 or shorter quarterback have sustained success in a long time, but Murray has a rare skill-set with his arm talent, mobility and instincts,” Brugler said. Murray’s high school career alone has already made him a Texas legend. Playing for powerhouse Allen High School, just outside of Dallas, Murray won three straight state championships at Texas’ highest level and his team went 42-0 with him starting. His brief stints provided glimpses of a potential star. This season, as the focal point of Lincoln Riley’s creative offense, Murray developed into the dominant player he had seemed destined to become while at Allen..
Oklahoma’s seventh Heisman matches Ohio State, Southern California and Notre Dame for the most by any school. Murray is the fourth Oklahoma quarterback since 2003 to win the Heisman, joining Jason White, Sam Bradford and Mayfield, and the 16th quarterback overall to win the award in the last 19 years.